This buzzword has been thrown around a lot in the last 5 years as we become more and more aware of the growing population and the impacts this will have on water quality and water quantity. Water Sensitive Urban Design (WSUD) is more focused around the management of the quantity of storm water runoff from new developments, and managing the quality of this storm water. The end goal of WSUD is to introduce to reuse and recycle of clean water to enhance the environment. Many cities and new developments are adopting WSUD techniques to meet their water quality objectives. With environmental law becoming more prominent and enforceable, it is in the best interest of the developer to introduce WSUD techniques to avoid getting fined. There are some really interesting and clever WSUD techniques around, and some of them you can’t even see. Bioretention basins are the first WSUD technique and most common to be implemented. Bioretention basins are similar to a dam where the overland runoff flows into and is retained. The difference here is that bioretention basins have vegetation within the dam to help biologically filter out all the nutrients. This leaves behind clean water, and also enhances the amount of vegetation on site. Bioretention basins typically have a porous medium such as gravel at the bottom, and sand at the top. In this way, the water can percolate through the basin and continue down into the stormwater network. This stops the slime and scum from accumulating that is sometimes seen in traditional dams. Bioretention techniques can also occur through the use of swales and constructed wetlands. Swales are generally seen in the median strip of roads where the road runoff enters the grassed channel and flows. 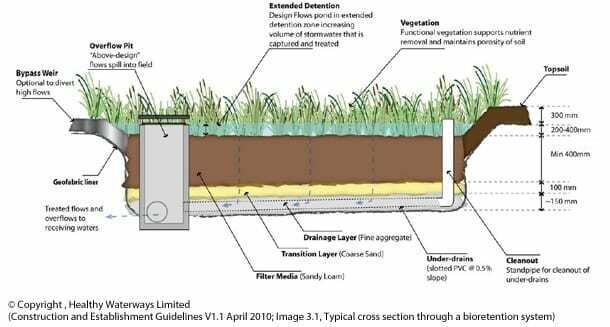 By grassing the channel and possibly implementing some other small vegetation, the water gets filtered as it flows and the grass and other vegetation flourish in the process. Figure 2 shows an excellent example of a new median strip swale in Pyrmont’s Pirrama Park. A new technology coming through is the use of rain gardens, otherwise known as self-watering street trees or biopods. These techniques are a cross between Bioretention basins and swales. All too often we see councils or even home owners construct a garden and then continually water them with clean water to keep them alive. With these techniques, the runoff from carparks, roads, pathways and other impervious surfaces is allowed to enter into a garden which waters the garden and filters the water. Again, a porous media is typically used to allow excess water to percolate through and enter a piped stormwater network, or to just soak into the ground (depending on the scale of the technique). This significantly reduces the amount of water being used for landscaping purposes, and improves the visual amenity of the area. It’s a win-win for everyone. These techniques can be used in a community as a centerpiece as well. Parklands or other natural areas are excellent sites to implement some or all of these WSUD techniques (plus others) as people love to get away into the natural environment for picnics, relaxation, family days out, etc. This can in turn be used as an economic building block, and before long the ecological sustainability of a community in terms of environment, social and economic aspects is growing. If used wisely, WSUD is the way forward and will ensure the sustainability of the environment even with the ever growing population.